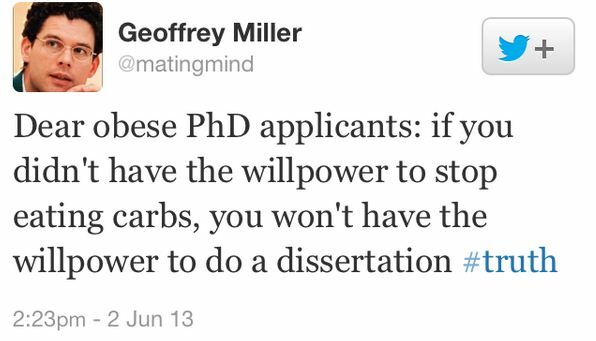 Dr. George Miller, an Associate Professor of Evolutionary Psychology at the University of New Mexico (currently visiting NYU), shared this bit of fat hatred yesterday. One of his colleagues at NYU called out the fat hatred in a retweet, and the story has now gone viral. He since apologized, and has now set his Twitter feed to protected. Questions have been raised about the influence that his fat hatred plays in his role as a member of the graduate admission committee for his program. As noted by many, it raises concerns about the unspoken rules that often guide selection processes. This is not about this one guy who tweeted this one hateful thing – it’s about our larger culture and how we are content to allow fat individuals to exist as second class citizens. Buy a second plane ticket, pay more for healthcare, only be represented in the media in a negative fashion – all of these are regular parts of life for fat people and very few seem to care. I’m not interested in responding to Dr. Miller. While I appreciate those who want to call him out, and yes he deserves it, I’m more interested in addressing the social narratives in which individual comments like Dr. Miller’s are encouraged. I’m also interested in the structural aspects of fat oppression. I decided that what I wanted to do was to highlight all the amazing fat individuals who are in graduate school, or have completed graduate school – to provide a visual repository for anyone who doubts that fat individuals lack the abilities or qualities to succeed in academia. And to celebrate the amazing work being done by these rad fatties! I present to you FuckyeahFatPhDs – check it out!